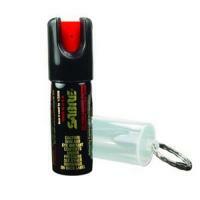 Sabre's compact .54 ounce 3-In-1 Pepper Spray provides convenient portability and can be kept discreetly in your pocket or purse with its key ring attachment. Sabre's canister packs 25 three-fold shots of eye-watering protection that will stop anyone in their tracks--combining the powers of pepper spray, military-grade tear gas and invisible UV dye to mark your attacker. The ballistic-style stream maximizes impact on potential assailants and has an effective range of up to 10 feet. Sabre sprays have a four-year shelf life. SPRAYS CANNOT BE SHIPPED BY AIR. ORDER ONLY IF YOU ARE IN THE CONTINENTAL UNITED STATES. SHIPPING TO A P.O. BOX IS ALSO PROHIBITED. *State laws prohibit shipment of this model (KR-14 ) to: AK, DC, HI, MA, MI, NY and WI.